Apparently the best way to measure the height of a tree is to climb to the very top and drop a line down to the ground, then measure the line. You’ll have to take our word for this as unofficial tree climbing is not allowed on the Tall Trees Trail, but we do have England’s tallest tree here on Exmoor. 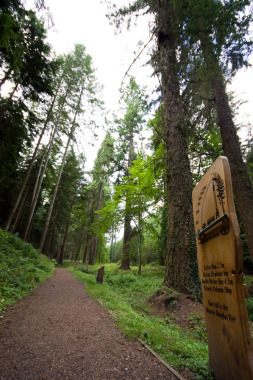 Standing 61.3m high the splendid Douglas Fir can be found on the Tall Trees Trail on The Dunster Estate just 100 metres from the previous title holder (which came in at 60.02m). The estate, owned and managed by the crown is just over a mile from Dunster village and offers a network of waymarked trails for walking and cycling. The Tall Trees Trail is smooth and wide and suitable for wheelchairs too.